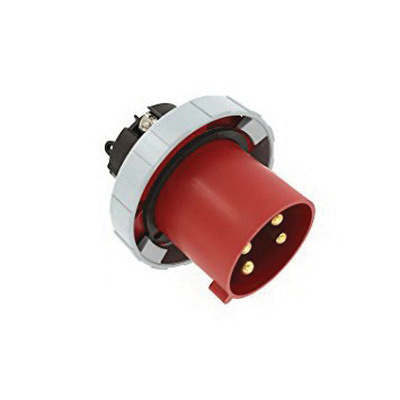 Leviton 5.71-Inch 4-Wire Watertight industrial grade pin and sleeve inlet in red color, features valox 357 construction. This 3-Phase 3-Pole inlet allows 3-1/0-AWG conductors and reinforced nylon contacts for greater strength and temperature resistance. It has a voltage rating of 480-Volts AC and current rating of 100-Amps. It has dielectric strength of 3000-Volts and withstands temperature of 0 to 32 deg C. Watertight Chloroprene onion skin grommet offers a precise, dependable seal at the cable entry point. It provides endurance up to 250 connects and disconnects, under load, at full rated current and voltage. The IP67/IP69K rated inlet has V-0 flammability rating per UL94 to withstand harsh environmental conditions. Inlet is UL listed, CSA/CE certified and meets IEC standards.